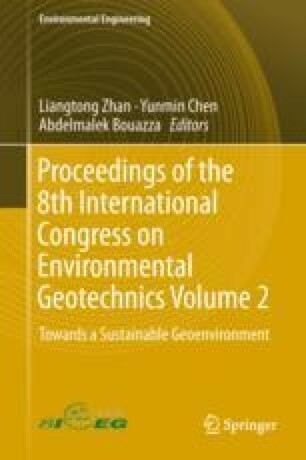 The objective of this paper is to present a comparison of measured hydraulic conductivities (k) for soil-bentonite (SB) backfill within a 60-m-long section of a 200-m-long, 7-m-deep cutoff wall constructed and instrumented for studying SB backfill properties and variability at the field scale. Backfill k was measured using flexible-wall tests (70-mm diameter) on remolded specimens prepared from surface grab samples collected during construction; flexible-wall tests on undisturbed specimens collected from the wall; larger-scale rigid-wall tests (150-mm diameter) on remolded specimens prepared from grab samples; and slug tests conducted within the wall. Applied effective stresses in the laboratory tests ranged from 4–35 kPa, encompassing the range of in-situ stresses measured in the backfill after load transfer and consolidation (8–13 kPa). The results indicate low spatial variability in k for a given test type, consistent with the observed homogeneity of the backfill. Modest variability in k was observed among the different test types, with the slug tests and rigid-wall tests generally yielding slightly higher k relative to the flexible-wall tests at field-representative stresses. Financial support for this work was provided by the National Science Foundation (NSF Grant 1463198). The opinions and recommendations in this paper are solely those of the authors and are not necessarily consistent with the policies of NSF. The authors thank Central Builders Supply (Montandon, PA) and James Gutelius, Bucknell Director of Civil Engineering Laboratories, for their invaluable support.